In hindsight, I should've copy pasted the title. Long story short I love YuGiOh. Use arts from it to make realistic mtg cards that either make sense with the card or translates the card to mtg. I'll make the rules up as we go. The popularity of this contest will determine the degree of prizes. Yeah Yu-Gi-Oh! Is a cool game! Would you allow an under design I have. 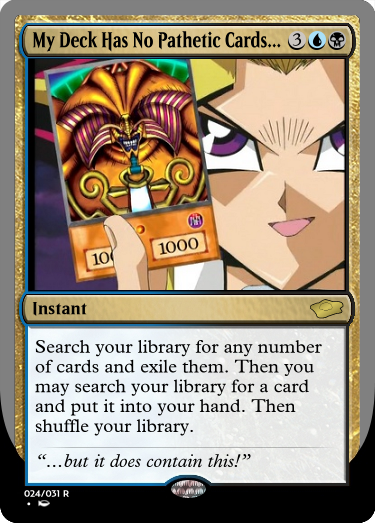 It isn’t too far out there as far as crazy effects go, it’s more silver bordered because it has yugioh art and flavor. Oh, I thought you were talking about a YouTuber. Yeah, yeah i did watch LittleKuribo's series. Made this a long time ago. Hope you like it.